World War I has been described as the ‘first modern war’, largely because it was the first war in which advanced machine guns, chemical warfare, tanks, attack aircraft and submarines were widely used. It was also the first ‘total war’, where nations mobilised all of their available resources for the war effort. Millions of people, mainly young men, lost their lives in this conflict, and towns, homes, businesses and farms were destroyed. So Why Go To War? Wars have many different causes, so it is important to look at both long-term and short-term factors. The long-term causes of World War I can be traced back to at least the mid 19th century. These included tensions between the European powers, the creation of the alliance system, the arms race, the Balkan wars,and the rise of nationalism. Long-term factors such as these often form the real basis for going to war, but in many instances it takes a catalyst to trigger outright conflict. In the case of World War I, this catalyst was the assassination of the heir to the throne of the Austro-Hungarian Empire. Less than two months later, all of the great powers of Europe were engaged in a bitter war that was to last more than four years. The Great War—as World War I was referred to at the time—was caused by a complex interaction of factors that had been simmering for more than 20 years. National rivalries, jealousies over territory, competition over economic progress, competition over the size of armies and navies, and the race to colonise new parts of the world all contributed to the tension. In the 1870s, a newly unified Germany had attempted to consolidate its place in European politics by developing a system of alliances. This system changed the nature of European diplomacy, and resulted in the development of two alliances, consisting of all the European powers. The powers believed that these alliances would act as a deterrent to war, because if a member of one alliance was attacked by a member of the other, all the members of both alliances would be involved. This was called ‘balance of power’ politics. In 1901, Europe appeared peaceful. Queen Victoria had occupied the British throne for over 60 years and many of her descendants married into royal houses all over of Europe. As a result, many of the royal families of Europe were closely related. Tsar Nicholas II of Russia, Kaiser Wilhelm of Germany and the British Prince of Wales (later King George V) were all first cousins. The Tsar’s wife was also one of Queen Victoria’s granddaughters. 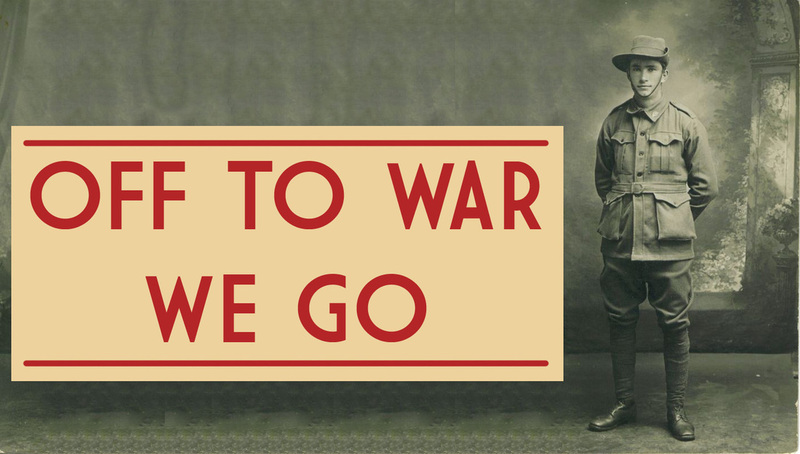 In the lead-up to World War I, many thought it was unlikely that close relations would become involved in armed conflict—and certainly not fighting on opposing sides. Left - Queen Victoria (seated front centre) photographed with members of her extended family in 1894. Kaiser Wilhelm II of Germany is seated front left. Right - Tsar Nicholas II of Russia with his cousin King George V—their mothers were sisters. On the surface, Europe seemed prosperous and peaceful at this time. The Industrial Revolution had transformed Western Europe, with new production methods and technology affecting almost every sector of society. Governments had made improvements in health care, sanitation and relief for the poor. Roads, canals and railways made transport easier and more accessible, and literacy rates were rising. The middle classes had generally been extended further political rights and enjoyed a higher standard of living. The working classes had also won some improvements, such as the right to vote in Britain after 1867. However, this prosperity masked both international and domestic tensions. There were jealousies among many of the royal families, despite their close relationships. Issues such as the different rates of economic progress, the size of colonial empires and the development of weapons, armies and ships all caused rivalry. The rate of economic progress, together with improvements in the standard of living, was also unevenly spread. The Industrial Revolution of the 18th and 19th centuries had little impact on the nations of Eastern Europe such as Austria–Hungary, the Balkan states and Russia. This contributed further to the rivalry between nations. Even in industrialised nations like Britain and Germany there was a huge gap between rich and poor. Many working-class families lived in cramped, unsanitary conditions or in urban slums. Women were still not allowed to vote in Europe, and nationalist movements divided people along ethnic lines. Many governments and people were afraid of the rising influence of radical movements like socialism and anarchism. Although Europe seemed to be peaceful before World War I, rivalries and tensions bubbled beneath the surface—so much so that by the time Archduke Franz Ferdinand and his wife were assassinated, Europe was ripe for war. 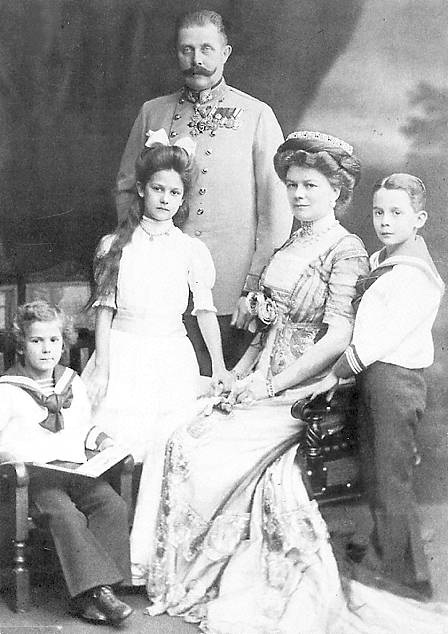 Image 02: Archduke Franz Ferdinand, his wife and two children. On 28 June 1914, a Serbian shot an Austrian. Within six weeks, many of the countries of Europe had become involved in a war that was to cause the deaths of 10 million soldiers, but was the assassination was only the straw that broke the camels back. The assassination of Archduke Franz Ferdinand signalled the rapid slide into world war, but this wasn't the only cause. There were four underlying causes in the run-up to the First World War. Research each of these terms in relation to the build up to WWI, and explain in your own words why each of them were a factor in the start of the war. 1. 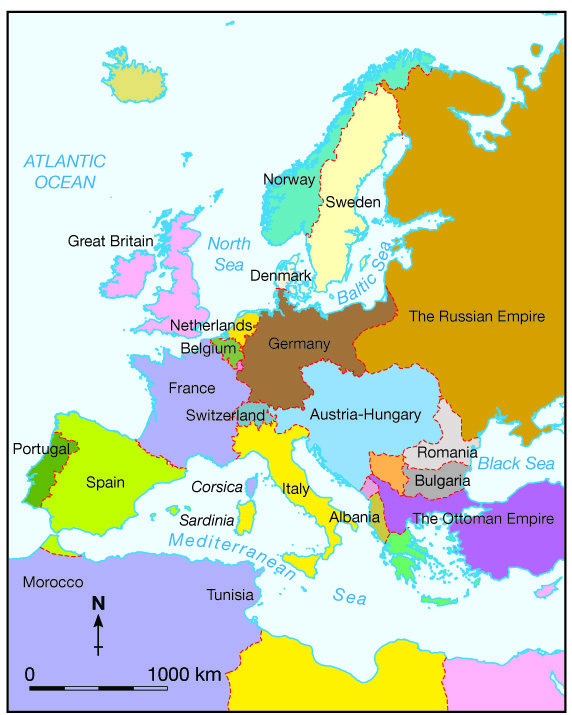 How would you sum up the situation in Europe around 1900? Explain your answer. 2. In your own words, explain the term ‘nationalism’, noting both its positive and negative features. 3. Why was Germany’s colonial empire so much smaller than Britain’s? 4. What is meant by the term ‘balance of power’ politics? Explain both the benefits and the drawbacks of this system. 5. Does an arms race necessarily mean that war is likely? Give reasons for your answer. The event that triggered the start of World War I took place in the Balkan states, an area of south-eastern Europe (See Map on Left). The Balkans were very unstable. Three major imperial powers were actively involved in the region: Austria–Hungary, the Russian Empire and the Ottoman (Turkish) Empire. The complex relationships between these powers made the Balkans a potential crisis point. Austria–Hungary controlled parts of the Balkans and, in 1908, had annexed (taken control over) Bosnia–Herzegovina. Russia supported Serbian nationalists, who wanted Bosnia–Herzegovina as part of Serbia. The Emperor of Austria–Hungary was aware of the tension in the Balkans. Believing that the people would be dazzled and charmed by a royal visit, he sent his nephew and his wife on a goodwill visit to the city of Sarajevo in Bosnia–Herzegovina. On 28 June 1914, most of the people of the area lined the streets, enthusiastically welcoming the royal couple. However, a small group of Bosnian Serb nationalists took the opportunity to show their feelings about their imperial rulers. While visiting the city, Archduke Franz Ferdinand and his wife Sophie were shot and killed by Gavrilo Princip, a member of a Serbian nationalist group called the Black Hand. 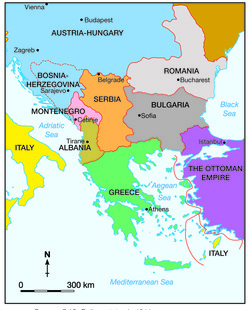 The expansion of the conflict from an incident in the Balkans to a world war was a direct result of the alliance system. Austria–Hungary, with support from Germany, quickly issued an ultimatum consisting of ten demands to Serbia. Serbia agreed to accept nine of the demands but refused to agree to the last one—that officials from Austria–Hungary be involved in the investigation into the assassination of the Archduke. When Serbia failed to agree to all ten demands, Austria–Hungary declared war on Serbia on 28 July 1914. Russia saw itself as Serbia’s protector. It responded by mobilising its army for war against Austria–Hungary and Germany. On 31 July, Germany demanded that Russia stop these preparations for war. Russia did not respond and so Germany declared war on Russia. The Germans had also asked the French government what its intentions were. France issued a vague response, stating that it would ‘follow its own interests’. By 1914, the German General Staff had decided to invade France through Belgium in the event of a two-front war. This was based on a 1905 strategy drawn up by Chief of Staff Alfred von Schlieffen, called the Schlieffen Plan. Russia would take at least six weeks to get its army ready for war. France would be easily defeated in six weeks. Belgium would not resist any German attack. If war broke out, Germany would attack France by marching through Belgium. Belgium and France would be quickly defeated, after which Germany could turn its attention to Russia. If this plan was implemented, it would violate Belgium’s neutrality. Britain had signed a treaty in 1839, guaranteeing to come to the defence of Belgium if another country attempted to invade its borders. As a result, the German invasion of Belgium forced Britain to become involved in the growing conflict. Why did the Archduke and his wife tour Sarajevo? Why did Serbia reject Austria–Hungary’s ultimatum in July 1914? Carefully examine the key dates leading up to World War I (Above). 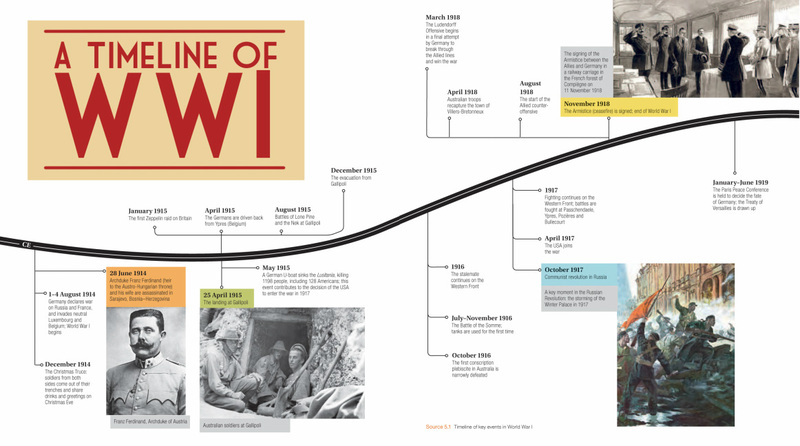 Use this information to construct a flow chart that shows the lead-up to World War I. How do you explain the fact that the rulers of Britain, Germany and Russia, although they were first cousins, were engaged in such bitter conflicts with each other over the course of World War I? 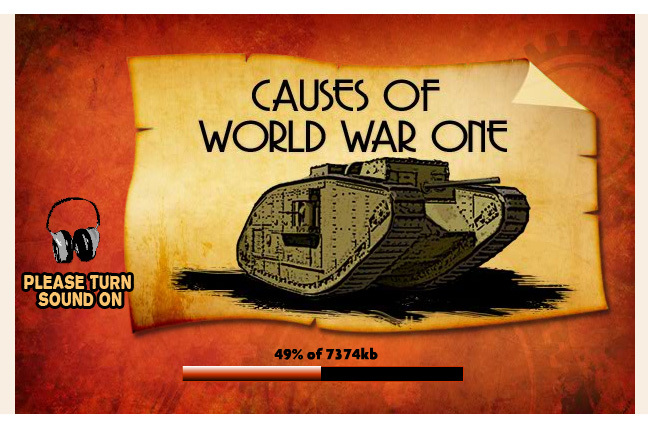 Examine the background of World War I and list and briefly explain all the major causes of World War I. From your list choose the cause that you believe was most significant and explain why you have chosen this cause. 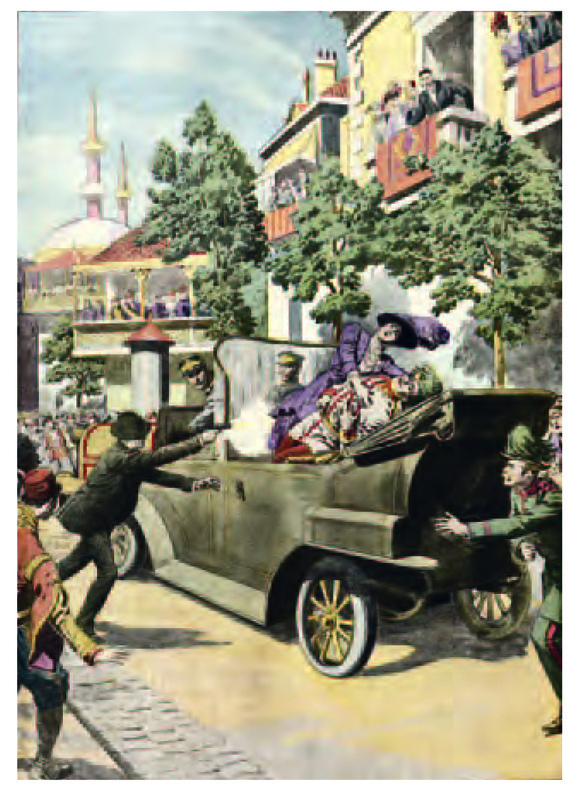 If the assassination of the Archduke had not taken place, do you believe that World War I would still have occurred? Explain and support your opinion.